Below you will find a list of frequently asked questions along with their answers. If you don’t find the information you are looking for, please contact us with your own questions. Q: What is the purpose of "Work Force management?" software ? A: Work Force Management software serves companies that send sales persons or technicians or other employees into the field by helping them automate scheduling, time sheets, field data collection, and dispatching etc. It can take care of client management, job management and payment for the jobs. Using such software make your work easy, accurate and fast. Q: Our Business is different and we use a lot of custom forms. Can we still use it ? A: Work Force Tracker is highly customizable piece of software. It means that we can easily incorporate forms like what you use, and those forms will be automatically available to your field staff to complete. This is the beauty of this software. It is easy to use, powerful and sophisticated. Q:Do I have to buy a server to install Work Force Tracker? A: No, there is no software installation on your computer. 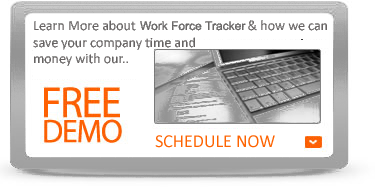 Work Force Tracker is a software-as-a-service (SaaS) solution. The software is provided to you via the internet for a monthly fee per user. You can access it from any computer or tablet that has internet access. Q: Do I need special handheld devices to use Work Force Tracker in the field? 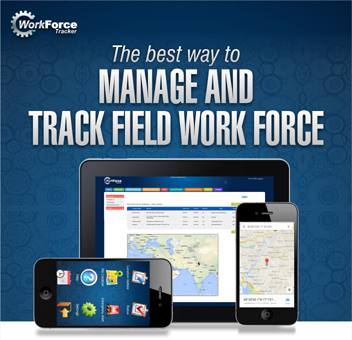 A: Work Force Tracker is available as a native mobile app for both iPhone and Android devices. So no special hand-held devices are necessary to access Work Force Tracker in the field. You can download the mobile apps for free from their respective app stores. Mobile devices only address the mobile enabled features. But, you can perfectly use all the features of the software without your field workers carrying mobile phones. Q: What other mobile devices do you plan to support for the Work Force tracker? A: We currently support Android and iPhone. We may support Windows Mobile-8 and Blackberry-10 phones in the future. Q: Do I need to provide Mobile phones to my employees? A: Mobile application provides convenience and certain additional functions like location reporting to the dispatcher. If your staff does not carry or wants to carry smart phones, you can still use the system without mobile phones. We provide Web based interface to the field staff. They can get all their job assignments and other information either by email or in the printed paper form. A: There are no start-up costs – just the low monthly fee per user. Most other field service automation solutions have additional fees for initial setup or system training, but not Work Force Tracker! We truly deliver our service as an “all-in-one” solution. Q: What is the annual support cost? There is no annual support cost for Work Force Tracker, because it is provided as an all-inclusive service. 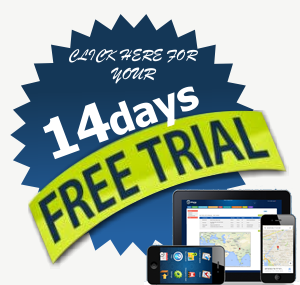 Your monthly fee per user is the only recurring charge you will incur from Work Force Tracker. Customer support and technical support are included in your service. So are new features and enhancements as they become available. Q: Why can’t I “buy” the software and own it? At Work Force Tracker, we believe in the long term value of software-as-a-service (SaaS) solutions such as ours. Although the legacy model of purchasing a software package may seem cost-effective at first, the hidden costs of “owning” software are astronomical. For starters, annual maintenance fees are typically 20% of the purchase price and usually don’t include the cost of upgrading versions or adding new features. Additionally, the cost to support the hardware or environment the software runs in requires IT resources that most small businesses don’t have. When you “own” the software, you “own” all of these additional costs — and headaches — as well. With our solution, you get all of the support, all of the new features, and all of the stress-free usage of your solution at no additional expense. You always know exactly what Work Force Tracker will cost you on a monthly basis! Q: Why Work Force Tracker for field service software? It’s a completely web-based hosted software application – No hardware installation or purchase, no software installation or purchase. Just a simple web browser interface needed for a software application we maintain to make running your service business operations as easy as possible. We offer a competitive monthly subscription fee – No expensive software or hardware to be purchased, maintained, or upgraded. J ust a low monthly fee for our valuable services. It’s easy to use – Work Force Tracker easy to learn and use web-based solution saves time and effort that can better be directed towards increased customer service and satisfaction to maximize profits. It can easily export data – Data can be shared with Outlook and QuickBooks, as well as others, through a simple data exporting process. We tailored our software application to fit your service business needs – Our flexible solution immediately adapts to your service business needs. We provide easy to access Customer Support – Although our web-based solution is extremely easy to use, we are here to help. There’s no risk or commitment necessary – There are no long-term subscription commitments to get started with Work Force Tracker. Still not sure if our system is for you? Why not take a30 days free trial. We are confident after experiencing the added value our web-based solution create…you’ll let us help you streamline your business for years to come. Q: The above sounds all very interesting, But Will It Work For My Business? A: Of course, it will, We have the capability to even add custom features. It works for any field service business in any industry – Flexibility and a wide range of service industries are a principal focus of our web-based solution. If it’s a field service business, Work Force Tracker is for you. It cooperates with non-computerized paperwork – Even if your employees are more comfortable producing paper Work Orders and summaries, our solution will provide added value and integration. Q: Is it Safe to Use an Online Web-Management System? We Take Advanced Security Measures – Advanced Secure Socket Layering and reinforced Firewall’s protect the integrity and security of both you and your clients data. We Back Up All Your Data – All data is within the Work Force Tracker Database is backed-up daily and multiple copies of these backups are stored for extra protection against an unlikely event of a failure. You Can Receive All Data at Any Time – You can receive a complimentary download of all your data upon a request. Q: Telephony Calling Interface - Can I use it to call any one in the field or my Customers ? Yes - you can call any one. Your field staff or your customers. You can use it for your marketing activities such as automated reminders or automated sales call. You will additional software from us to do that and you will pay for the calling minutes at a very low per minute charges.